I’m finally back on the Christmas stockings. I seem to have gotten past the learning curve on the pattern relatively well as I got through almost the whole foot on lunch today. I expected once I finished the first, that the subsequent stockings would go much faster. 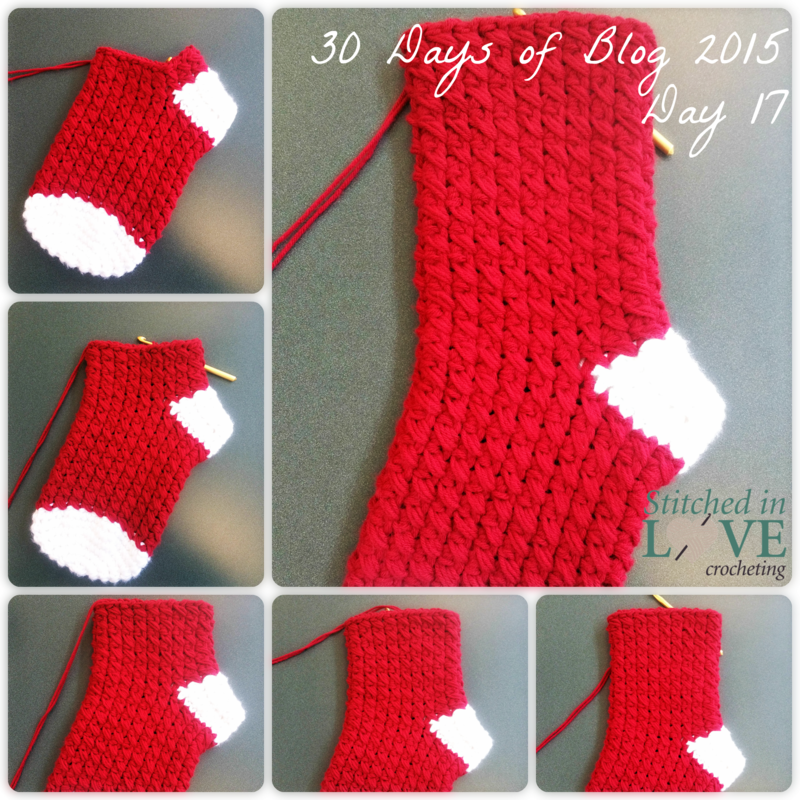 It is also going faster since I’m making this stocking in a solid color rather than changing colors every other row. I ‘m less confident that I can get all of the stockings done by the end of June now, but it’s still possible. So I mentioned that I had purchased myself a new crochet bag. As I have started to use it, I have to say I have developed mixed feelings about it. It’s like a carry on bag, with casters and a telescoping handle in the back, which is very handy. It has grommets on the front to pull yarn though so you don’t have to open it when working. There are three clear plastic pouches to go with these on the inside to hold yarn skeins. 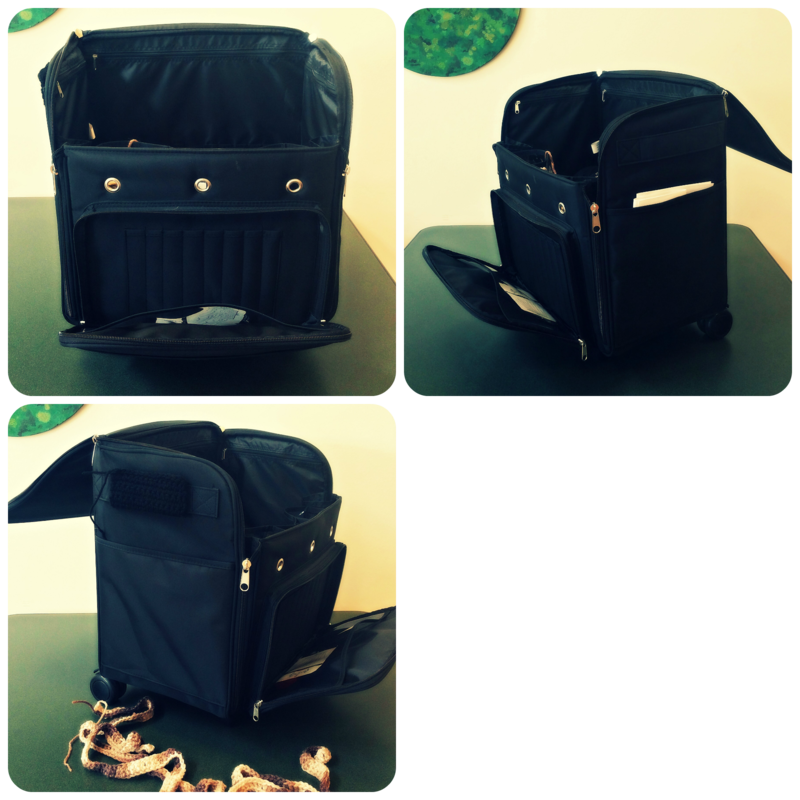 There is a zipper pocket on the front with several storage options and compartments in side. There are pockets on the outside on both sides where I can easily slide in patterns and other things. And the biggest thing for me is there is a nice large interior space, particularly helpful for when I am working on projects with large skeins of yarn (like the Caron one-pounders I am using for the stocking project right now) or when I am working on an afghan and it starts to get too large to carry around in my regular tote. 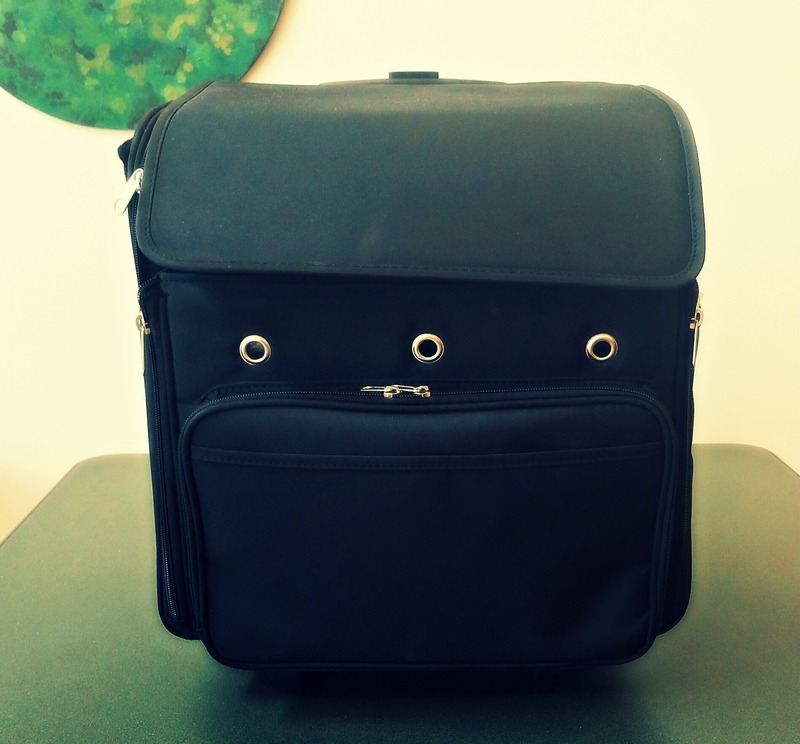 It will also be helpful for taking multiple projects with me on trips. That was probably the biggest reason I got it. But there are several things that I really disappointed in. The top only zips closed on the two sides. The front just kind of hangs over. There are three zipper compartments on the inside walls, but when you open them up they’re just directly exposed to the cardboard supports for the case. The aren’t really meant to be separate storage. Inside the front storage pocket, there are slots for crochet hook storage. I don’t know about other crocheters, but this is really unnecessary for me because I just keep all of my hooks together in a soft zipper Boye hook case. I would have liked this space to be used for another storage option. Finally, the biggest frustration for me is that there really is not another way to carry the tote, especially one-handed, than the telescoping handle for rolling it. There are straps on each side which really require using two hands, and are only useful for picking the case up from the floor to put up on the counter, bed, etc, not for carrying it. This makes it very awkward when you are rolling the case along and come to a set of stairs. Right now, I’m just picking it up by the extended handle and awkwardly carrying it up or down the stairs. When the handle is retracted, there is not room to get your hand between it and the case to carry it that way. 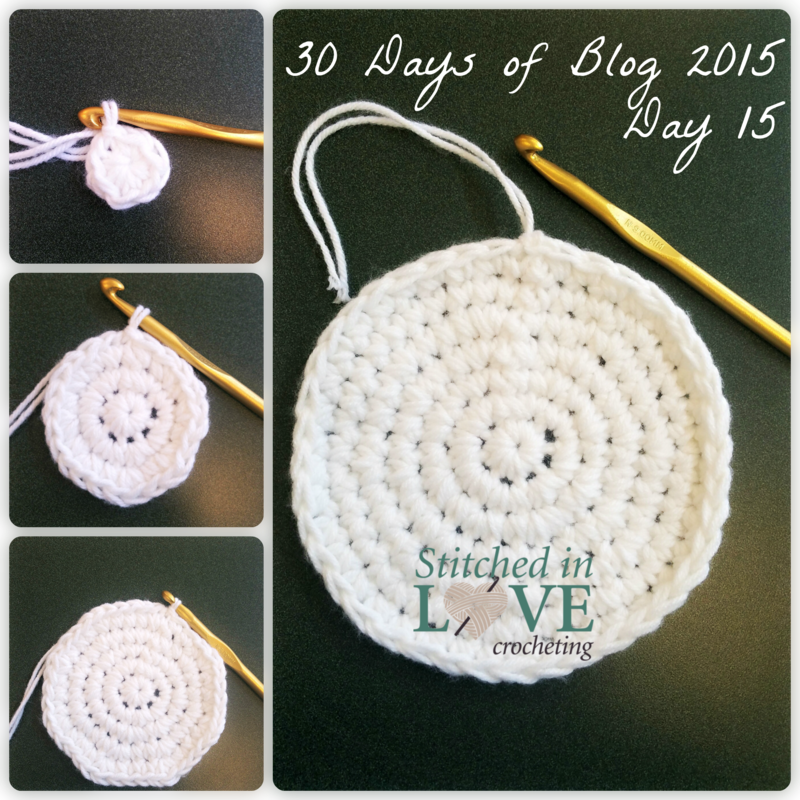 So, I am currently in the process of crocheting a shoulder strap that utilizes the handles on each side. I am still very excited to have this case, but I really wish that I had been part of the design team. This stocking is just shy of officially done. I’d forgotten to do the hanger and take a picture of it. I’ll have to add a picture of that later. 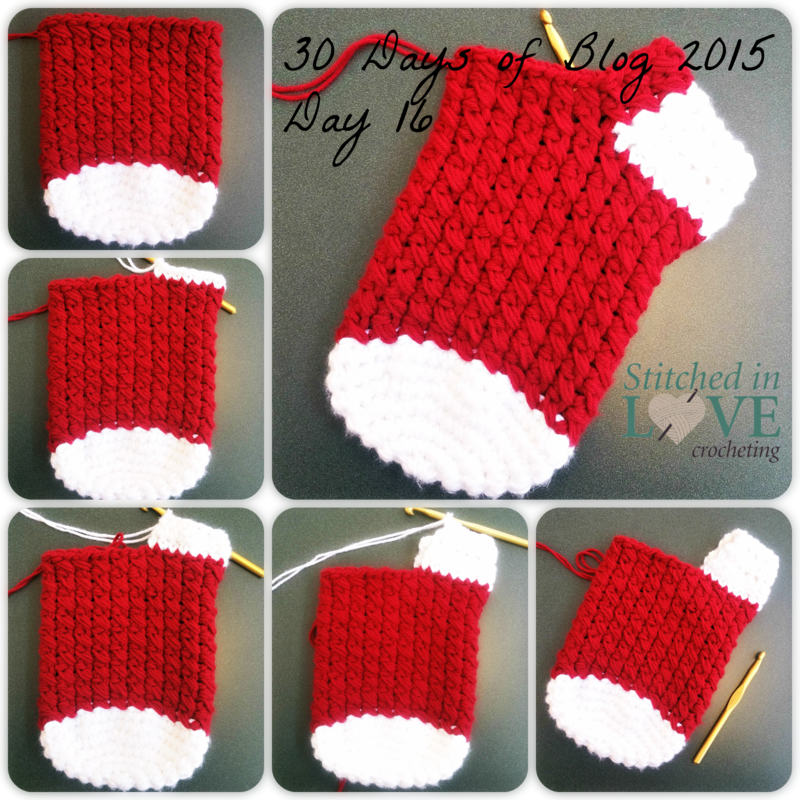 Now I think I’ll start on my stocking which I’ll do in red with white toe and heel. I am both irritated and excited right now. This spring, I found a pattern for a top I really liked in my Herrschners catalog. Unfortunately, the pattern only comes in a kit with yellow Caron yarn. There is no choice of the color, which would of course just make too much sense. I even emailed their customer service department to see if I could order the pattern without the yarn and that’s not an option either. So not only is Herrschners selling an otherwise free pattern and only offering it in one color, they’re basically selling the yarn for more than its list price because they’ve inflated it to include the pattern. (The pattern that’s actually free. Do I keep repeating that?) You can buy enough yarn on the Yarnspirations website to make a large top for $17.16 versus $19.99 from the Herrschners catalog, (plus the free pattern of course). So, if you want the (FREE) pattern for this cute little top, click on the picture. I’m excited to have it printed off and I know the exact yarn in my stash that I will be making it with! Now I just have to figure out where to fit it in. I want to do it sooner than later because I want to wear it this summer. But I have so much planned!